St John’s wort, scientifically known as Hypericum perforatum, is a flowering plant in the Hypercaceae family which has been used medicinally to treat depression and a wide variety of ailments for thousands of years. Other common names for this herb include: Johnswort, Amber, Touch-and-heal, Goat weed, Hardhay, Klamath weed, Rosin rose, Hypericum, and Tipton weed. • Treats depression: This herb contains many chemical compounds, including hypericin and hyperforin, which act in a similar way to SSRI’s (Selective Serotonin Reuptake Inhibitors) by preventing nerve cells in the brain from reabsorbing serotonin, making more serotonin available to assist the brain cells to send and receive chemical messages. Clinical trails show St John’s Wort to be more effective than placebo and equally as effective as standard antidepressants. It has also been shown to keep the circulating levels of four key neurotransmitters (serotonin, noradrenaline, dopamine, and gamma-aminobutyric acid) at levels that improve depressive symptoms. Studies also show that St John’s Wort lowers levels of the stress hormone cortisol, and enhances the activity of gamma-aminobutyric acid, a mild sedative, in the brain. It also increases the number of serotonin receptors in the brain. • Aids in the treatment of SAD (Seasonal Affective Disorder): This condition only occurs seasonally during winter due to lack of sunlight and has been found to respond favourably to St John’s Wort. It is thought to be particularly effective when combined with phototherapy. Although one of the side effects of St John’s Wort is increased photosensitivity, this treatment can still be effectively used via lightbox therapy, as lightboxes do not emit ultraviolet radiation. • Helps to treat OCD: One of the components present in St John’s Wort, hypericum, affects the serotonin system. Disruptions in this system are linked to the development of symptoms of OCD. Studies suggest that hypericum may be as effective as other drugs such as paroxetine and clomipramine, which also effect the serotonin system and are effective in treating OCD. A study published in The Journal of Clinical Psychology showed that in an experiment with 12 people with OCD, St John’s Wort caused an improvement in OCD symptoms after just one week. There are mixed results with other studies testing the effectiveness of St John’s Wort and OCD, with much more research and studies needed on the topic. • Helpful in reducing stress and anxiety: St John’s Wort is highly effective at reducing the levels of the stress hormone cortisol in the body, while causing an increase in the levels of “feel good” hormones such as serotonin and dopamine by preventing the brain’s nerve cells from reabsorbing them. • Improves sleep and reduces sleep disturbances: Not only is St John’s Wort effective in reducing the levels of stress hormones present in the body, it also acts as a mild sedative helping to reduce stress and induce sleep. St John’s Wort acts to stimulate the GABA receptor which is an essential pathway for sleep-inducing chemicals in the brain. It also stimulates the production of serotonin by reducing the reuptake absorption of serotonin via the nerve cells. Serotonin goes on to encourage the production of melatonin, which is an essential hormone for sleep. Studies suggest that this herb may also extend the final stage of non-REM sleep. • Has strong antiviral properties: These antiviral properties, combined in particular with its anti-inflammatory properties, cause it to have an effect on various viral conditions such as shingles, herpes, cytomegalovirus, Epstein-Barr virus, influenza types A and B retroviruses, and the human immunodeficiency virus (HIV). Studies on mice found that low doses of hypericin and pseudo-hypericin prevented retroviral-induced diseases. It also inhibits the ability of certain virus offspring to replicate and has been shown to directly inactivate the replication process of certain viruses that previously had the ability to replicate. • Helps with pain: St John’s Wort has been reported to have a pain reducing and sedative effect, causing it to be effective at treating the pain associated with conditions such as arthritis, gout, sciatica, neuralgias, pinched nerves, and Bell’s palsy, along with other general aches and pains. This herb also has strong antispasmodic properties, causing it to have a positive effect on painful digestive spasms, menstrual cramps, and spasmodic coughing. Studies suggest this herb is the most beneficial in treating nerve pain and conditions. As well as regulating mood, serotonin also plays an essential role for pain transmission and sensation. Higher levels of serotonin cause a decrease in pain sensitivity, therefore the positive effect St John’s Wort has on serotonin levels causes a pain-relieving effect. • Improves nerve health and initiates peripheral nerve repair: St John’s Wort causes a neuroprotective action, aiding in the treatment of neurogenerative and mood disorders. It improves the survival of neuron cells by protecting them against oxidative stress, and also prevents neurodegeneration and neurotoxicity. 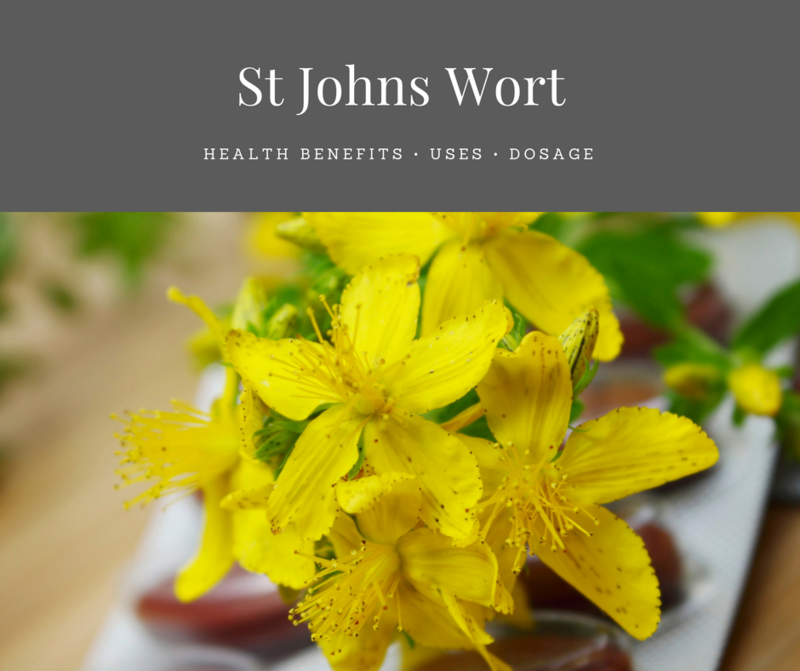 Animal studies have shown St John’s Wort to reduce inflammation and enhance antioxidant defences to speed and support the recovery of damaged nerves. The hyperforin compound present in the herb acts to reduce oxidative stress and biochemical changes to the neurons that connect the spinal cord and the periphery. This action may relieve neuropathic pain and reduce the inflammation of the nerve cells. The combination of anti-inflammatory, antioxidant, and neuroprotective properties of this herb may also aid in nerve regeneration. • Aids with curbing addictive tendencies: Studies indicate that this herb is beneficial in reducing cravings and withdrawal symptoms associated with quitting addictive substances. Dysregulation of the neurotransmitters serotonin, dopamine and GABA (gamma-aminobutyric acid) are observed in alcohol abuse and disorder, as well as other addictions. Antidepressants including St John’s Wort have been seen to be effective at treating comorbid depression and alcohol withdrawal associated insomnia. Animal studies have confirmed that St John’s Wort inhibits alcohol intake, reduces the motivation to consume alcohol, and creates an aversion to the substance. It is also effective in treating alcohol induced depression. • Regulates hormones: This herb is beneficial in regulating the thyroid and actively reduces hypothyroidism symptoms by helping the thyroid gland to produce adequate amounts of hormones. • Skin wounds and dermatitis: Applied topically via salves or tinctures, it speeds up the healing of burns, bruises, insect bites, and cuts by stimulating the circulation of oxygenated blood to those damaged skin cells to induce repair. Its antibacterial, antiviral, and anti-inflammatory properties are also beneficial in reducing swelling and preventing infection. • Improves cardiovascular health: by helping to lower blood pressure and reduce stress on the heart. St John’s Wort has an anti-atherosclerotic effect on the arteries. The herb has been found to dramatically reduce the levels of apolipoproteins, triglycerides, LDL cholesterol, and C-reactive protein (CRP) in studies on rabbits. It also resulted in a lowered risk of atherosclerosis and an increase in “good” HDL cholesterol levels. • Helps reduce the symptoms of menopause: Some studies suggest that not only does this herb help to balance hormones, but it is also beneficial for women going through menopause in the fact that it is effective in reducing the occurrence and severity of hot flushes. • Fights cancer: Studies suggest that St John’s Wort is effective in halting the growth of cancerous tumour cells and can treat both melanoma and nonmelanoma skin cancers. This effect is due to the presence of hyperforin, a compound which interferes with key events in angiogenesis (the growth and formation of cells). • Improves PMS symptoms: Studies have shown St John’s Wort to be effective in relieving the symptoms of food cravings, swelling, insomnia, headaches, confusion, crying, anger, mood swings, difficulty concentrating, and fatigue associated with PMS. These studies concluded that St John’s Wort is more effective than placebo in treating physical and behavioural symptoms of PMS. Traditionally used as a tea, St John’s wort is also made into an oil for use in lotions and tinctures. It may also be taken internally as a capsule or tablet which are easily found in health food stores, pharmacies, and supermarkets. St John’s Wort in this form contains flavonoids, phenolic acids, glycosides, rutin, tannins, resins, and essential oils. Used topically, St John’s Wort can be used as a salve to treat wounds and bruises, used as a diluted oil to treat burns, used as an astringent to treat oily skin, or as a massage aid or compress to treat muscle pain. It can also be used via direct inhalation, and can also be found in chopped or powdered form. The oil should not be taken internally. • To make an oil with the fresh herbs: Allow the moisture to dry off the herbs over the course of a day before placing it into a jar or any other sealed container, and cover the flowers with olive oil, making sure all parts of the plant are fully submerged to avoid mould. Leave to infuse for approximately 4 weeks in a sunny spot before straining and storing in a cool dark place. This oil is used topically and is effective for bumps, bruises, scrapes, and sore muscles. The oil at this end stage should be a dark red colour. To make more potent, use the young flower buds of the plant before they have opened. • To make a tincture: Cover flowers with vodka in a 1:2 herb ratio. Shake daily and leave to infuse for 1 month before straining and storing in a cool dark place. To use the tincture, take 15 – 20 drops 2 – 3 times daily under consult of a physician. • To make tea with St John’s Wort: Steep 2 – 3 teaspoons of the flowers in hot water for 3 – 5 minutes before either removing leaves or straining. The suggested dosage for St John’s Wort is 900mg per day for treatment of non-melancholic depression, while 1800mg doses are recommended for the treatment of moderate to severe depression. The usual 900mg treatment can be split into thirds with 300mg taken 3 times a day. As with other antidepressant medications, this herb may take up to four weeks to exert any noticeable effect. While generally well tolerated, St John’s wort can cause gastrointestinal discomfort such as abdominal pain, nausea, vomiting, diarrhoea, and loss of appetite, as well as headaches, dizziness, fatigue, confusion, aggression, anxiety, dry mouth, sexual dysfunction, skin reaction and restlessness. This herb/supplement should not be used with the contraceptive pill as it decreases the levels of oestrogens such as oestradiol by accelerating its metabolism. The use of St John’s wort when taking the contraceptive pill can lead to decreased efficacy of the contraceptive and possibly unplanned pregnancy. St John’s wort can also cause photosensitivity, resulting in visual sensitivity to light and to sunburn. The burns caused by this sensitivity, particularly in those with fair skin can be severe and cause blistering of the skin and possible scarring. The severity will depend on the amount of the plant consumed, and the length of exposure to sunlight. Combining both St John’s wort and antidepressant medications could lead to an increase in serotonin levels, causing serotonin syndrome. Symptoms of this syndrome include: agitation, confusion, shivering, high body temperature, tremor, sweating, increased reflexes, dilated pupils, diarrhoea, seizures, and extensive muscle breakdown. St John’s Wort should also not be used in conjunction with another mood boosting supplement 5-HTP as this mixture can also cause serotonin syndrome. Some “mood enhancing” supplements contain both of these ingredients so it is important to watch out for this. Other popular herbs which can cause a negative interaction when combined with St John’s Wort include: ashwagandha, capsicum, German chamomile, goldenseal, gotu kola, hops, kava kava, lemon balm, sage, skullcap, Siberian ginseng, stinging nettle, valerian, and yerba mansa. The use of this medication is not recommended for those with bipolar disorder as there are concerns that St John’s wort increases the risk of mania in people with depressive bipolar. This medication should not be combined with a MAO inhibiter antidepressant as this combination can produce a dangerous rise in blood pressure or hypertensive crisis, as well as severe anxiety, fever, muscle tension, and confusion. St John’s wort should not be taken alongside certain foods that contain tyramine such as wine, beer, preserved meats, cheese, chocolate, sauerkraut, fermented soy products, and yeast extracts due to a MAO inhibition effect. The interaction between tyramine and these foods can be especially dangerous in people with high blood pressure. This herb can interfere with medications used during organ transplant including antirejection medications. St John’s wort can cause multiple drug interactions, including those of many prescription medications, cyclosporine, digoxin, reserpine, statin drugs, antihistamines, immunosuppressants, certain calcium channel blockers, migraine medications anti-seizure medications, anticoagulants, heart medications, HIV medications, cancer medications, warfarin, and any medication broken down by the liver, due to the induction of the cytochrome P450 enzymes CYP3A4 and CYP1A2. This results in the increased metabolism of certain drugs. Do not use this herb if you are pregnant or breastfeeding. It is not recommended to give this herb to infants or children. Always consult with a doctor before taking any new supplementation. However, in contrast to synthetic antidepressants, there have been no reports of Hypericum related deaths.